Dead easy to find! Turn off the A1(M) at the A6055 Boroughbridge road and head into town. Turn left after the Three Arrows Hotel, down Roecliffe Lane and the stones are a few hundred yards down, close to the motorway. The tallest is just off the road to the left, behind a gate (the owner of the adjacent house there is very pleasant), whilst the other two are across the road in the fields. 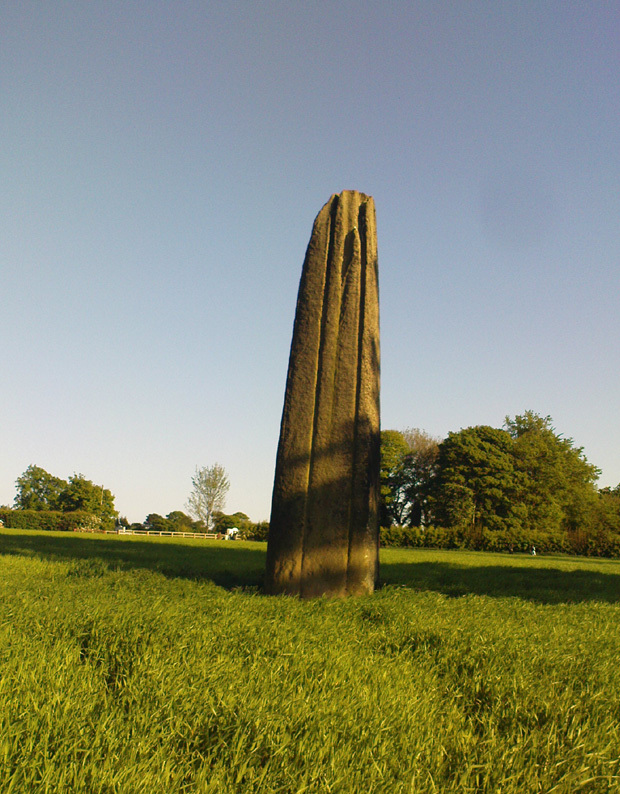 To many archaeo-megalithic and folklore fans, these huge standing stones need no introduction. These great heathen Arrows of the devil, today at least, are three gigantic standing stones, each one weighing several tons at least, standing in a rough straight line, nearly north-south. This is the greatest single stone-row anywhere in the British Isles. Well y’ never know! But who was this Peter Franck chap from the 17th century? It would be good to find out more of what he said. “A little without this Towne on the west part of Watiling-Streate stadith 4 great maine stones wrought above in conum by Mannes hand. They be set in 3 several Feldes at this Tyme. The first is a 20 foote by estimation in higeth and an 18 foote in cumpace. The stone towards the ground is sumwhat square, and so up to the midle, and then wrought with certen rude boltells in conum. But the very toppe thereof is broken of a 3 or 4 footes. Other 2 of like shap stand in another feld a good But shot of: and the one of them is bigger then the other; and they stand within a 6 or 8 fote one of the other. The fourth standith in a several feld a good stone cast from the other, and is bigger and higher than any of the other 3. I esteme it to the waite of a 5 Waine Lodes or more. Very close to the Arrows I’ve found records of other sites which someone can hopefully throw more light on, as I’m sure they will have had some relationship with the stones. Immediately west were (are?) the Penny Stones; plus a place called Bell’s Wife’s Field (Bel as a sun-god – though his wife may imply the moon). And just a few hundred yards east is the old Lady Well, mentioned elsewhere. Ackerman, John Yonge, An Archaeological Index to the Remains of Antiquity of the Celtic, Romano-British and Anglo-Saxon Periods, J.R. Smith: London 1847. The Stranger’s Guide; Being a Concise History & Description of Boroughbridge, John Mitchell: Boroughbridge 1846. Anonymous, Yorkshire Legends, Dalesman: Clapham 1969. Aubrey, John, Monumenta Britannica, Little Brown & Co: Boston 1982. Beck, Howard, Yorkshire’s Roots, Sigma: Wilmslow 1996. Bennett, Paul, The Devils Arrows, Heathen Earth: Keighley 2009. Bogg, E., Richmondshire and the Vale of Mowbray (volume 1), Elliott Stock: London 1906. Brayshaw,Thomas, ‘The Yorkshire Portions of Leland’s Itinerary,’ in YAJ 10, 1889. Burl, Aubrey, ‘The Devil’s Arrows,’ in YAJ 63, 1991. Burl, Aubrey, From Carnac to Callanish, Yale: New Haven & London 1993. Camden, William, Britannia, or a Chorographical Description of Great Britain and Ireland, Edmund Gibson: London 1695. Devereux, Paul & Thomson, Ian, The Ley Hunter’s Companion, Thames & Hudson: London 1979. Forrest, Bob & Behrend, Michael, ‘The Devil’s Arrows on Target,’ in The Ley Hunter,no.107, 1989. 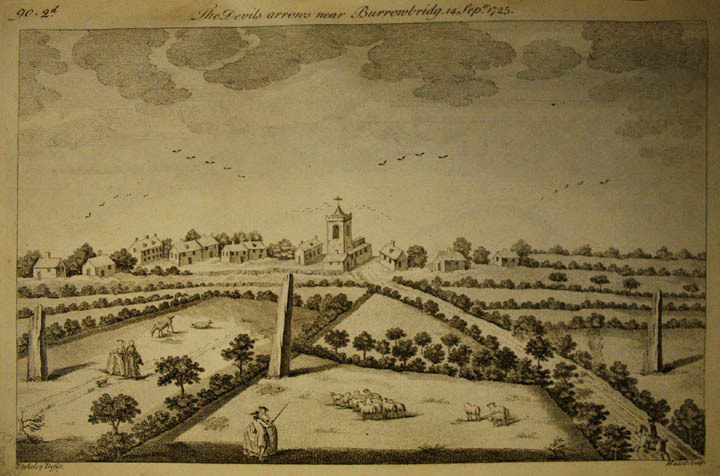 Lawson-Tancred, Lady, A Guide Book to the Antiquities of Aldborough and Boroughbridge, J. Topham: Boroughbridge 1948. Leadman, A.D.H., ‘The Devil’s Arrows,’ in The Antiquary, 1903. Leland, J.J., The Itinerary of John Leland the Antiquary, Fletcher & Pote: Oxford 1770. 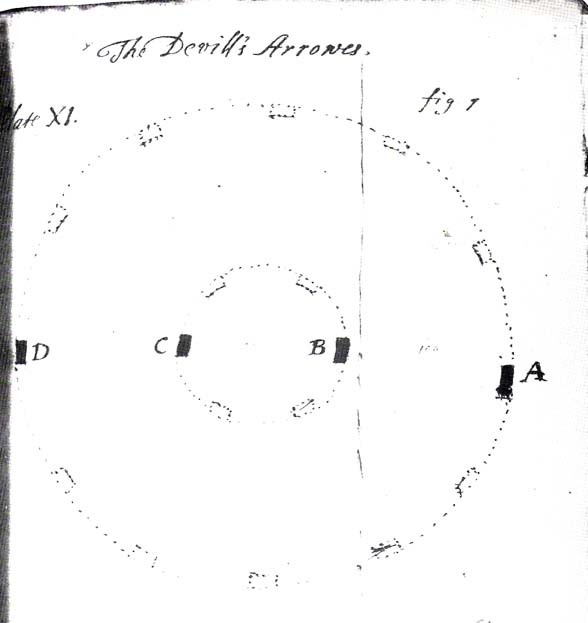 Lewis, A.L., ‘The Devil’s Arrows, Yorkshire,’ in Journal. Anthr. Institute, 8, 1878. Lukis, W.C., ‘The Devil’s Arrows,’ in Proc. Soc. Antiquaries London, volume 7, 1877. Lukis, W.C. (ed. ), The Family Memoirs of the Rev. William Stukeley – volume 3, Surtees Society: Durham 1887. Mee, Arthur, Yorkshire, West Riding, Hodder & Stoughton: London 1941. 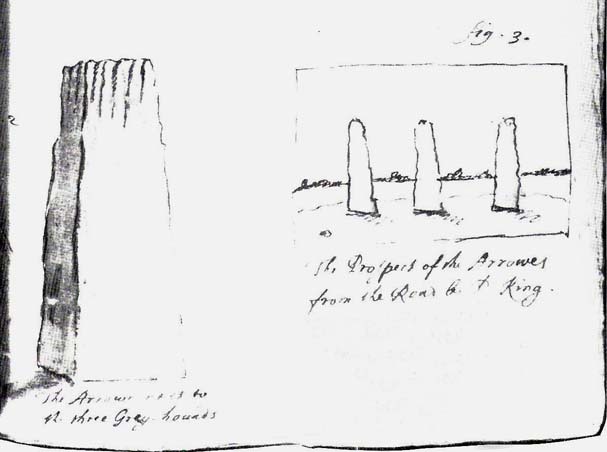 Mortimer, Robert, ‘The Great Monoliths at Boroughbridge,’ in The Geologist journal, London 1860. Radley, J., ‘Prehistory of the Vale of York,’ in YAJ 1974. Ross, Frederick, Legendary Yorkshire, William Andrews: Hull 1892. Smith, A.H., Place-Names of the West Riding of Yorkshire (volume 5), EPNS: Cambridge 1963. 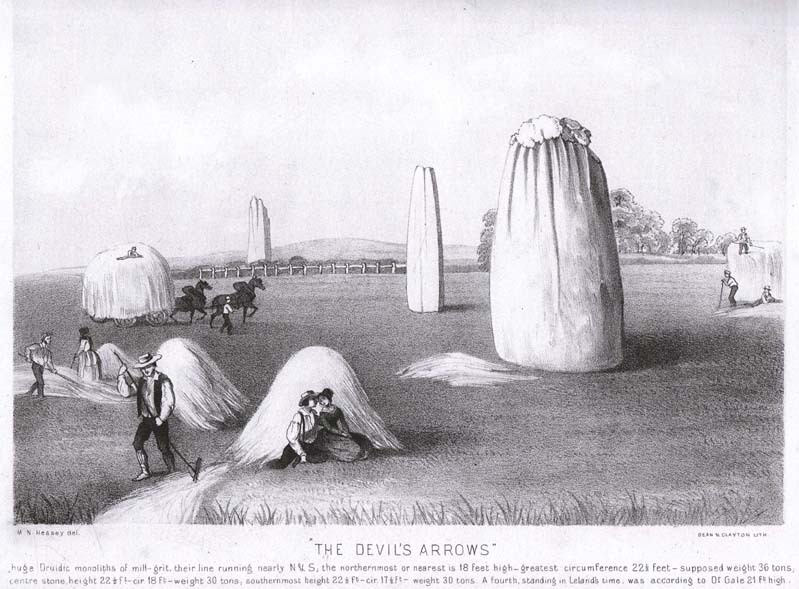 Somerville, Boyle, The Devil’s Arrows: Prehistoric Stone Monuments and their Orientation, B.A. Handbook, 1927. Stukeley, William, Itinerarium Curiosum (volume 2), London 1776. Thom, A.S. & Burl, Aubrey, Stone Rows and Standing Stones, BAR: Oxford 1990. 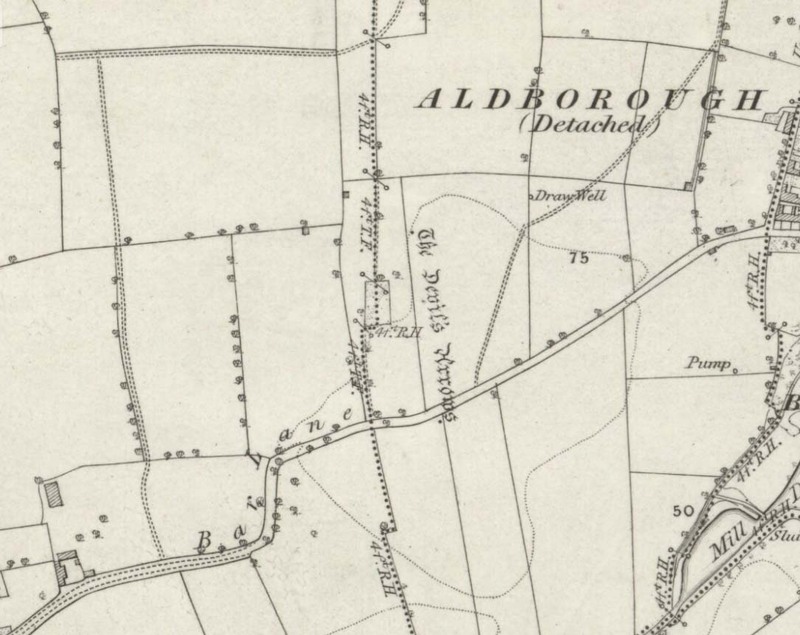 Turner, T.S., History of Aldborough and Boroughbridge, Arthur Hall: London 1853. Tutin, John, ‘Theory about the Three Arrows,’ Yorkshire Life 3, 1954. Walford, John. 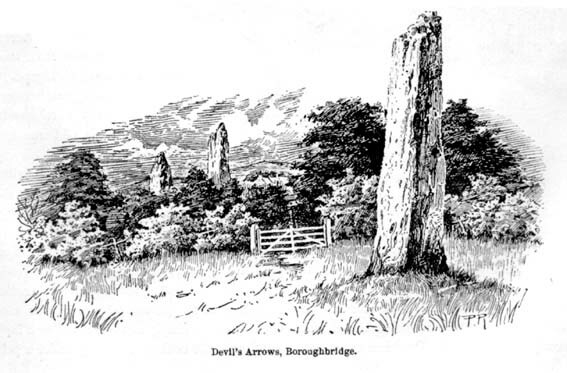 ‘An early description of the Devil’s Arrows, Boroughbridge, North Yorkshire,’ in Yorkshire Archaeological Journal, 79, 2007. 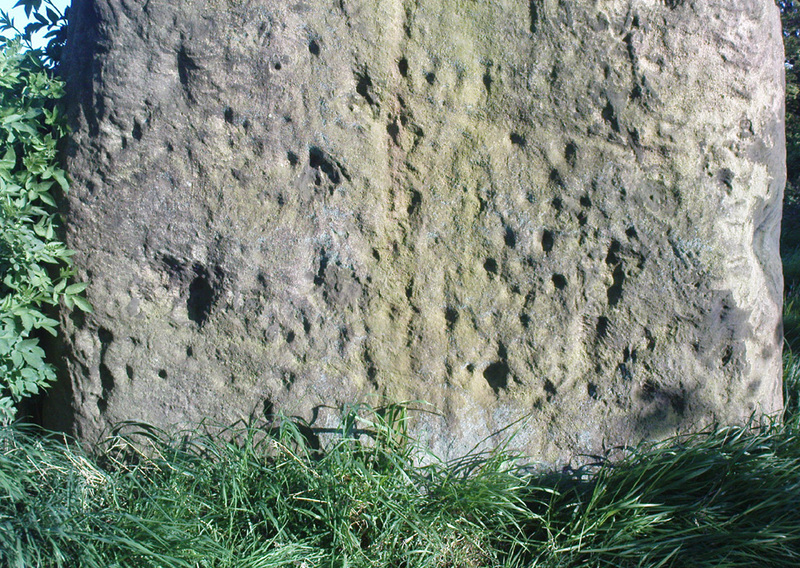 Wood, E.S., ‘The Grooves on the Devil’s Arrows, Boroughbridge,’ PPS 13, 1947. 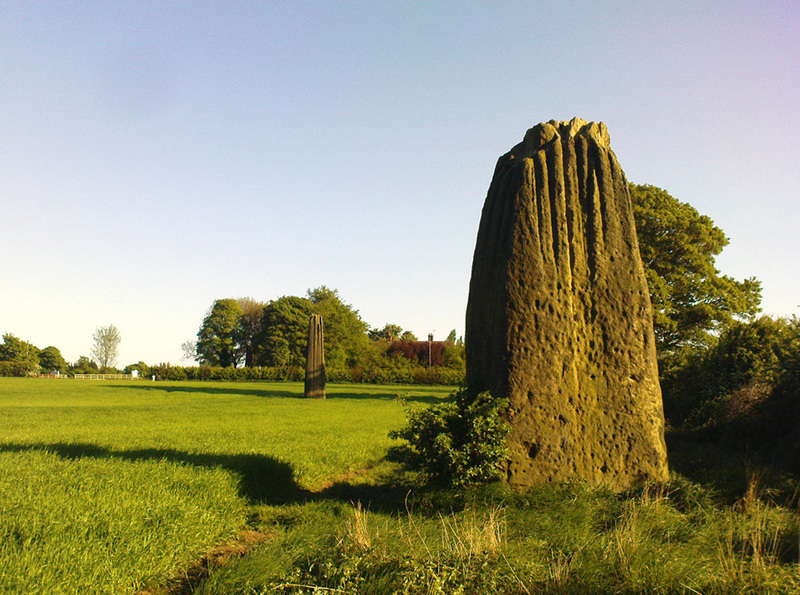 This entry was posted in Brigantia (Northern England), Standing Stones, Yorkshire, North and tagged Aldborough, alignments, animism, antiquarian, antiquities, archaeoastronomy, Archaeology, astroarchaeology, Boroughbridge, Bronze Age, devil, earth mysteries, England, english heritage, folk-lore, folklore, history, lunar standstill, megalithic, Megaliths, midsummer, monoliths, neolithic, North Yorkshire, place-names, prehistoric sites, sacred sites, Standing Stones, Stone Circles, stone row, tourist attractions. Bookmark the permalink.